Roll the brie in the bread crumbs to coat. Place a square of the phyllo on the worktable, and brush lightly with the melted butter. Place another square of phyllo on top of the first one with the corners offset. Brush lightly with butter and then place a third square of the phyllo on the others again with corners offset. Put the brie in the center of the phyllo, make a dimple in the brie with a teaspoon. Place half a teaspoon of the quince paste on top of the brie, then pull the phyllo up around the brie by the corners and pinch together just above the brie to form a bundle. Place on a baking sheet and repeat with the rest of the brie. Put the bundles in the refrigerator for 1 hour to chill the brie. 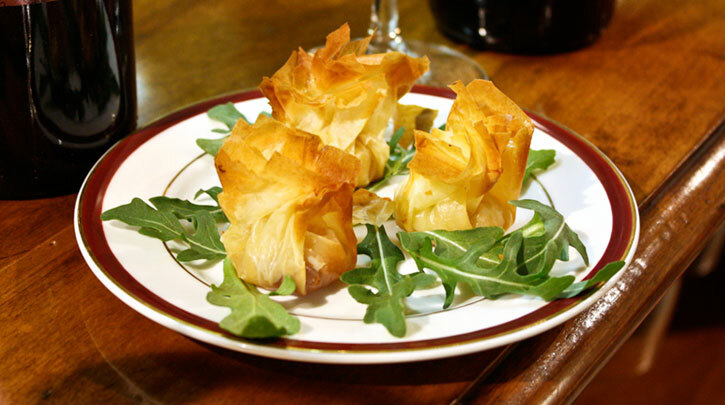 Preheat the oven to 400°F, remove the phyllo bundles from the refridgerator and place on the center rack in the oven. Make sure the bundles are not touching each other, before putting in the oven. Bake for 5-7 minutes until lightly browned. Serve warm.